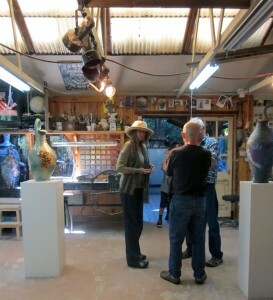 Today I spent visiting a few other local ceramic artists in their cleaned up, Ready for Prime Time 2012 Santa Cruz County Open Studios Art Tour habitats, gleaning the fruits of the passion we hold in common. Since I hardly get out of my paddock, it was a deliciously freeing promenade and I came home with treasures and photos from most of my stops. Up top you see my new wardrobe of mugs, my personal theme this year. At the end of this post you’ll see the tumbler, bowl, vases and grenade. I had only this one day to get out there, since I participate in this 3-weekend Tour myself and this wasn’t my weekend to be on. I mapped out a strategic travel itinerary like a seasoned Road Warrior for Art. I also announced to associated family and friends I was going it alone. May I recommend that? It makes for agile quality: timing, conversations and all the other decisions: Eat? Pee? See Everything on Every Shelf or Just Enjoy the Overview? It’s my own personal Artist Date, and dang if I ain’t good company to me!!! The real trick is getting out there as early as possible. Studios are open 11-5; be at the first one as soon after 11 as you can! (But, too early can be awkward.) Happy Hour everywhere is 1-3, so see if you can get to most places before then, or be prepared to swim upstream through the crowds and maybe not have that intimate artist chat. I did the best I could with the timing because I had a 50 mile loop to execute. I only got mildly lost twice, no, three times, the downside of no-one riding Navigator/Shotgun, I guess. First stop: Andrea Dana-McCullough, Artist # 265 ( she’s on the left in the photo.) Her love of carving through colored layers onto her pieces (sgraffito) is augmented nicely by her love of insects. I was on a personal quest for a Bug/Beetle Mug, which I found in snappy blue on white. It’s the upper right mug in my lead-off photo. 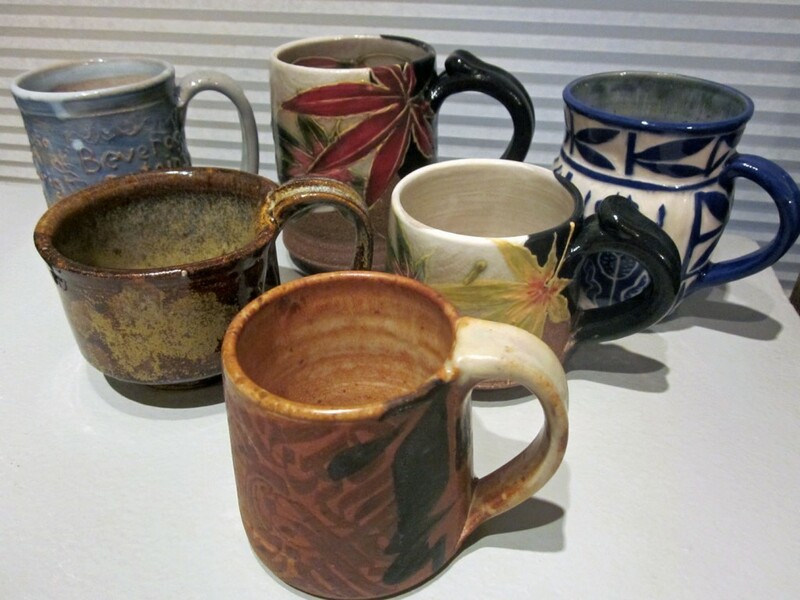 When I got home I washed and began drinking from each vessel in the order I’d acquired it today. Andrea’s was first and I was sorely tempted to just stay put. I have one other piece of hers, a small tray, and these won’t be the last! At the farthest reaches of my loop was Travis Adams, Artist # 279. He has the entire back work area and yard of the fabulous Santa Cruz Mountains Art Center STUFFED with his amazing range of work. It was a massive effort and looked wonderful. 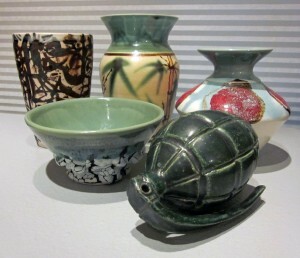 I had to have one of his grenades – see last photo – and then a dangerously drooly crawl-glazed bowl (also below) caught my eye and a sweet little teadust mug – middle left up top. Travis has also SO generously displayed not only my own OS postcard, but the conetop Travis Beer can I traded him for one of his rat sculptures earlier this year. That’s what he’s holding in the photo. My Tribe…I think I’ll keep them! Looking happily occupied with visitors (back to the camera) is Mattie Leeds, who along with wife Melissa, are Artist Studio #289. 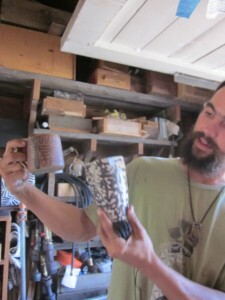 There is no shortage of things to see here on this Bonny Doon land, the penultimate lifelong ceramic artist habitat. From slightly unbelievable shard-pile mosaic installations, to a formal display room, to the working rooms and kilns, it’s huge and worth the trip. It’s lovely that you can wander the cavernous multi-level inside and outside as long as you like. I didn’t buy a Mattie Mug…I have in the past. Instead we spoke of his recently child-proofed studio (!) and of the piece I REALLY want…. 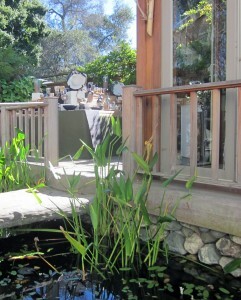 Another lovely artist habitat up by the wilds of UCSC and Pogonip is that of Jeannine Niehaus, Artist #240. The yard, the teahouse and her sure-handed thrown and slip-decorated pieces all play well together. Since I have a fall birthday, I was thinking of her bright maple leaf decorations on a little sumpin’ sumpin’….I know….a mug!!!! How about TWO? (Middle right and back in the top photo.) Jeannine never stopped long enough to pose; her yard was full of aficionados. (I waited until they briefly cleared from her teahouse deck to take this shot.) She was cheerfully watering her bedding plants and chatting the while and setting a fine example of how to genuinely represent. 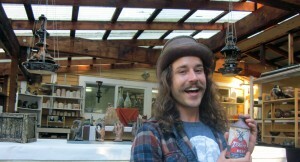 Just look at the smiling Hank Scott, Artist #235 at Saltwater Pottery! He’s a first-timer to Open Studios, but obviously NOT to pottery and decorating. With a clear palette and style, I think he’s found a lively following. I bought one vase for me (short with red dots) and one for my mom (creamy with bamboo), both seen below. 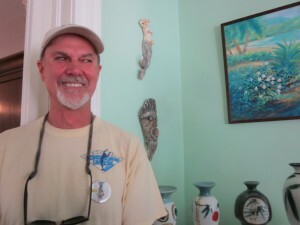 His late 1800s home is a well-restored Santa Cruz original and it was SRO by the time I was there. I think he might feel encouraged! So….the one photo op I did not get to take was with Geof Nicastro, Artist #163 and Rocky Lewycky, Artist #162. They both are showing in the expansive space behind Clay Creation on Soquel Avenue and have a wide and sympatico offering. I was just settling in for a spell and selecting a blue impressed cylinder mug of Geof’s (seen at the top left) when a huge crowd descended upon the two – I’m talking a couple dozen folks on a bus tour! Lucky Geof and Rocky! – I held my mug close, pressed money into Geof’s hands and left through the back path in the hedge. Sometimes it’s like that! Love you two, and here’s to a fruitful Encore Weekend! I toast your creativity. SO wanted a panoramic shot….take one and send it to me….I’ll include it here. 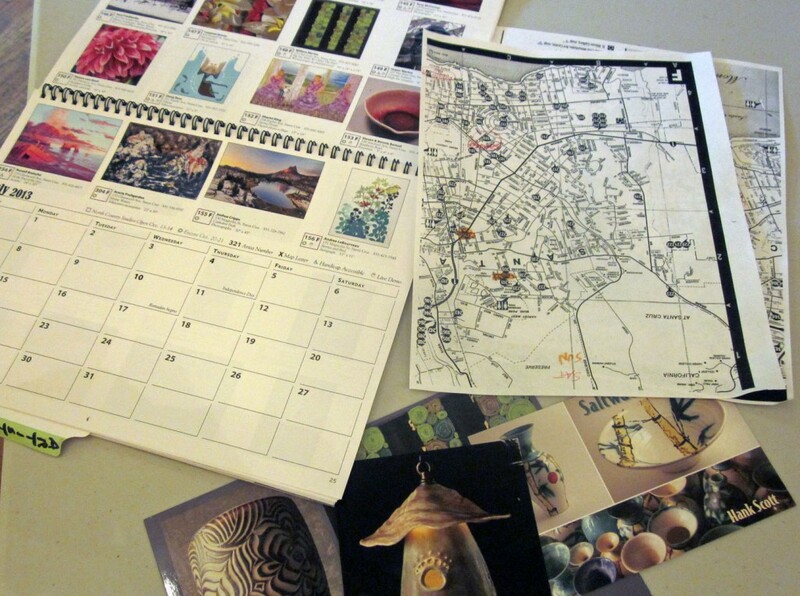 So, that’s a full day touring the environs of eight ceramic artists in my tribe on the Cultural Council of Santa Cruz County’s annual Open Studios Art Tour. We are rich beyond belief here in the Fifth Most Artistic Locale in the US. ~Liz Crain, who is proud to be associated with these fellow ceramic artists and the many more she couldn’t get to either because there is still only one of her (dang it!) or because they are holding Open Studios at the same time she is. Tribe, just the same! Oh, and notice everything hunted and gathered today – even the grenade – was thrown on a potter’s wheel, which Liz does not do herself, but profoundly appreciates.